Dine at Manjok Ohyang Jokbal, a restaurant recommended by the famous Korean TV Network YTN! Available at multiple branches in Seoul that provide for convenient dining and a good variety of menu options! Ok first of all, it's worth it to get your jokbal experience here. Definitely must try. However, we just want to remind everyone that you need to get to the front counter and tell them your VOUCHER NUMBER which is below the QR code (the front counter had a small book which recorded all the klook reservation numbers). When we first entered, the manager just pass us a queue number even though we told her that we made a klook reservation, and told us to wait outside (which we did because we were 10 mins early). But when the time comes, the manager let other customers in and that's when we decided to force the manager to look at our mobile voucher. After getting our voucher no, she immediately allocated us our table and immediately served the food, which was pretty efficient. Dine at Manjok Ohyang Jokbal in Seoul, a recommended restaurant by Korean TV network YTN, and enjoy delicious Korean food at great prices! This restaurant is known because of their unbeatable recipe of melt-in-your-mouth jokbal (pig's trotters) cooked with soy sauce and various unique spices. Try the original jokbal for a traditional flavor or go for a new twist with the bul-jokbal, spicy pig's trotter made with cheongyang red pepper powder. You will also get to try out bossam, steamed pork cooked with a special meat broth, and enjoy an assortment of side dishes like dumpling soup, rice cake soup, shredded garlic, kimchi and more! Manjok Ohyang Jokbal has multiple branches in Seoul in City Hall and Dongdaemun that offer a wide range of menu options that's perfect for Korean food adventures with friends and family. Manjok Ohyang Jokbal is known for their delicious jokbal that just melts in your mouth! Set meals are the way to go when you want to enjoy the restaurant's best with family and friends! Manjok Ohyang Jokbal is very popular in Seoul, but dining is no problem with their fast service! We ordered the spiced pig’s trotters bossam set menu good for 2-3 persons in Dongdaemub, but it was actually good for 3-4 persons! It was a new dish to us but we enjoyed eating the trotters with cabbage dipped in vinegar sauce. Also, the dumpling soup was perfect for the winter season! Pair the food with a bottle of beer :) Also, it says the resto accepts orders until 12am but the guy there told me they close at 11:30. Our reservation was at 11:45 and we came in at 12:15am because our flight was delayed. They said we can come back the day after, and they still accommodated us. Kamsahamnida!! We ordered the spiced pig’s trotters bossam set menu good for 2-3 persons in Dongdaemub, but it was actually good for 3-4 persons! It was a new dish to us but we enjoyed eating the trotters with cabbage dipped in vinegar sauce. Also, the dumpling soup was perfect for the winter season! Pair the food with a bottle of beer :) Also, it says the resto accepts orders until 12am but the guy there told me they close at 11:30. Our reservation was at 11:45 and we came in at 12:15am because our flight was delayed. They said we can come back the day after, and they still accommodated us. Kamsahamnida!! It is easy to locate the place and the food we ordered was so delicious a must try restaurant in Seoul. It is easy to locate the place and the food we ordered was so delicious a must try restaurant in Seoul. This is cheaper than walk in to the restaurant and you just need to tell the waiters that you bought this coupon. It was so delicious and I very recommend. However, as it was a popular restaurant, you need to wait outside even you bought the ticket already. Just a warm remind. This is cheaper than walk in to the restaurant and you just need to tell the waiters that you bought this coupon. It was so delicious and I very recommend. 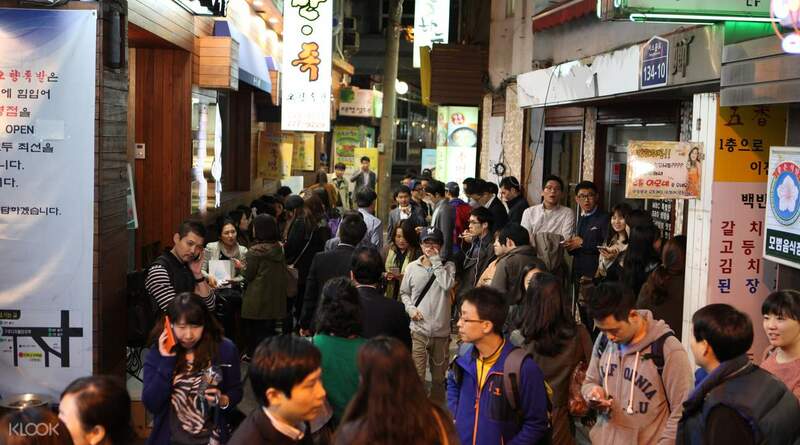 However, as it was a popular restaurant, you need to wait outside even you bought the ticket already. Just a warm remind. Using Klook to book combo meal online is very convenient. We chose two of the most famous combo meals for four people. The portions were so big and delectable. Everyone was quite full and felt satisfied. Using Klook to book combo meal online is very convenient. We chose two of the most famous combo meals for four people. The portions were so big and delectable. Everyone was quite full and felt satisfied. Nice dining experience. Spiced pig's trotter is very tender but mostly fat n skin especially at the bottom of the plate. However the foreigner set for 2 is enough for 3 adults. 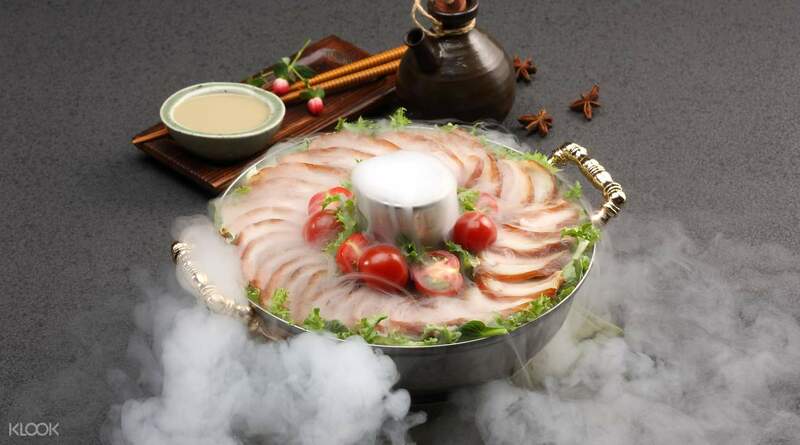 Besides pig's trotter, dumplings and steam eggs, there is a big pot of soup with rice cake and more dumplings inside. Nice dining experience. Spiced pig's trotter is very tender but mostly fat n skin especially at the bottom of the plate. However the foreigner set for 2 is enough for 3 adults. 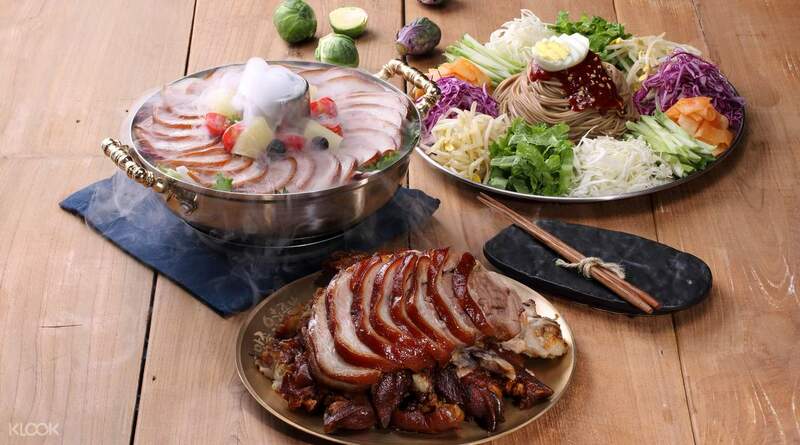 Besides pig's trotter, dumplings and steam eggs, there is a big pot of soup with rice cake and more dumplings inside. Their Bossam is really good. I think they are a Michelin star (awarded) restaurant. When we got there, they immediately served soup and banchan to us. There’s a little confusion with our order but was quickly resolved. For Filipinos: rice isn’t included in set menu. You can order for 1,000 won per cup. Their Bossam is really good. I think they are a Michelin star (awarded) restaurant. When we got there, they immediately served soup and banchan to us. There’s a little confusion with our order but was quickly resolved. For Filipinos: rice isn’t included in set menu. You can order for 1,000 won per cup. We just showed our voucher to the staff upon entry and were quickly seated. We ordered the set with both jokbal and bossam which came with dumpling/rice cake soup, kimchi over tofu with cabbage, and a variety of side dishes. Portions were more than enough for 2 and we enjoyed all of the food! We just showed our voucher to the staff upon entry and were quickly seated. We ordered the set with both jokbal and bossam which came with dumpling/rice cake soup, kimchi over tofu with cabbage, and a variety of side dishes. Portions were more than enough for 2 and we enjoyed all of the food! We ordered the Spicy & Spiced Pig Trotters set L for 3-4 people. Really tasty, but the portion was not that much, maybe because we did not eat the fatty parts or skin. I wonder if you could try asking for leaner meat. You could add on rice as the spicy portion was really spicy! We arrived at the restaurant (City Hall branch) on an earlier date & were kindly accepted as the place was not full. Staff can speak basic English & one can speak Mandarin very well. Overall, a much recommended meal! We ordered the Spicy & Spiced Pig Trotters set L for 3-4 people. Really tasty, but the portion was not that much, maybe because we did not eat the fatty parts or skin. I wonder if you could try asking for leaner meat. You could add on rice as the spicy portion was really spicy! We arrived at the restaurant (City Hall branch) on an earlier date & were kindly accepted as the place was not full. Staff can speak basic English & one can speak Mandarin very well. Overall, a much recommended meal!